Texas holdem poker is the perfect variation of poker for beginners. It’s also one of the most popular types of poker played both online, and in casinos around the globe. Poker can initially seem quite daunting to new players, but most new players are able to grasp the basics fairly quickly. When starting out, it’s a good idea to keep a list or printout of all the possible winning combinations of cards found in poker. By keeping a list of these combinations, and how they rank in order of strength, you’re less likely to miss any potential winning hands. Bluffing is a huge part of poker, and learning to bluff and read other player’s bluffs is a beneficial skill. Although it is difficult to know precisely what hand your opponent possesses, looking out for key indicators. Keep an eye on other players during the poker game, you will quickly notice the betting patterns of other players. A good way to spot bluffs is by looking for any drastic changes in the betting patterns of your opponent. The strategy that you use in a poker game is key to your success. It can be very easy to get carried away when playing poker, which often leads to players falling at the first hurdle. Before entering a game, you should make sure that you have considered the possible losses and how they may affect your bankroll. You may wish to employ a strategy in which you calculate the odds of your hand being better than any other player’s. For example, by looking at the other cards on the table and the possible hands that can be made from them, you’ll have a better understanding of the strength of your own hand. You can then place bets based on this, and only bet if you are confident in the strength of your hand against any other ‘possible hands’. The first thing to be aware of in a Texas Holdem game is the dealer button. 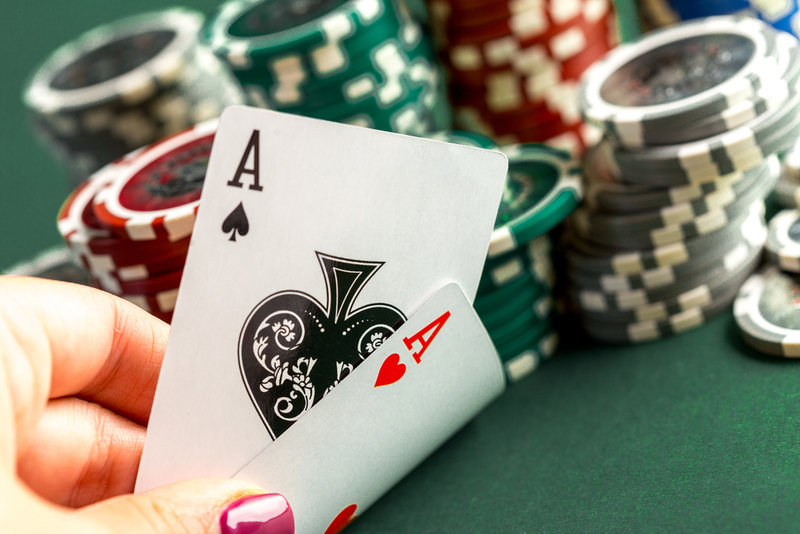 The dealer button is automatically allocated during online poker games, and the cards are automatically dealt. However, the dealer button indicates which players will post the blinds to get the game started. In Texas Holdem there are two types of blinds, the ‘big blind’ and the ‘small blind’. These are obligatory wagers that players place to get build the pot. The dealer button moves around the table after every round, meaning that all players have to post blinds equally throughout the game. The ‘small blind’ is usually half the value of the ‘big blind’. The player sat directly left of the dealer button posts the small blind, and the player sat to the left of the ‘small blind’ poster, posts the big blind. The aim of poker is to have a better combination of cards than your opponents. These combinations of cards are known as ‘hands’, there are a number of possible hands in poker and each are ranked differently. You can view the possible hand rankings here. In Texas Holdem, five cards will be dealt on the table for players to create hands with, these cards are visible to all players. Each player will also be dealt two cards which they keep hidden from other players. A bet can be responded to by using the following terms. Fold – Means you do not wish to match the bet, and forfeit your cards for that round. First, all players are dealt two cards each, the blinds are also posted at this stage of the game. This stage is known as the ‘pre-flop’, players can choose to bet at this stage before any cards have been dealt on the table. Next, ‘the flop’ is dealt, this is where three cards are dealt on the table and players are allowed to place bets again. Following the flop, ‘the turn’ will be dealt, this is where another card is dealt on to the table before the final card which is known as ‘the river’. There are opportunities to bet after ‘the turn’ and ‘the river’. After the river card is dealt, players must reveal their cards to determine the winner. Next Post: If Texas Is the King of Poker Variants, Then Omaha Is Surely the Queen!